disguise (cf. Space Western). But the western isn't the only genre, perceived by many to be nothing but clichés, that can be reworked into something resembling sci-fi. In everything but a few incidental details, DC Comics' Star Hawkins was the kind of private detective hero that's been with us since about the 1920s or so. Like most fictional private eyes, Star had been battered by life, and his well-lined face showed it. He was basically a good guy, but with a cynical attitude brought on by years of crawling around the seamier portions of society. He operated out of a seedy office located in a less-than-optimal section of a large city (New City — possibly the culmination of the practice of naming cities New York, New Orleans etc.). He couldn't afford better because despite the fact that he was very good at detecting, he wasn't all that good at making a living. In fact, he sometimes, during periods of especially bad cash flow, had to pawn essential pieces of equipment just to keep the rent paid. As the series opened (Strange Adventures #114, March 1960, year 2079 within the series), he'd just done that to Ilda, his robot secretary. Ilda was just like the average fictional private eye's secretary — tough, smart, good at her job, and amazingly willing to put up with the hardships that come with working for a guy who doesn't always succeed in keeping up with the bills. In her case, that meant frequent incarceration in the pawn shop. But he always redeemed her, and always promised it would never happen again — which, of course, she never believed. It was his equivalent of being late with her paycheck. If the series had been done completely straight, it would have come off as hackneyed. But Ilda's dual role as both friend and companion, and pawnable asset in times of stress, set the tone for a wonky take on the genre. The detective did serious work in solving his cases, but always got chuckles out of the readers along the way. Writer John Broome (Phantom Stranger, Captain Comet) and artist Mike Sekowsky (also known for oddball interpretations of Metal Men and Wonder Woman) made Star Hawkins stand out among the many series Strange Adventures ran over the years. After his initial case in the 114th issue, Star returned in the 116th, then in every third issue over the next several years. The other issues rotated two other series, Atomic Knights and Space Museum. This continued until editor Julius Schwartz (The Flash, Rex the Wonder Dog) moved on to other projects, and all the running series ended. Star's last appearance under his editorship was in #162 (March, 1964). Unlike the others, Star came back. In #173 (February, 1965), the new editor, Jack Schiff (Space Ranger, Tomahawk), gave him a new adventure, written by Dave Wood (Dial H for Hero) and drawn by Gil Kane (Iron Fist). He went back to being an every-third-issue regular until #185 (February, 1966). Then it was oblivion for a decade and a half, until DC ran one last story about him in the back pages of DC Comics Presents #33 (May, 1981), where the main stars were Superman and Captain Marvel. In this outing, Star finally (year 2092) got a lucrative case, and even made a permanent connection with the last of the many women in distress he'd encountered over his career, heiress Stella Sterling. 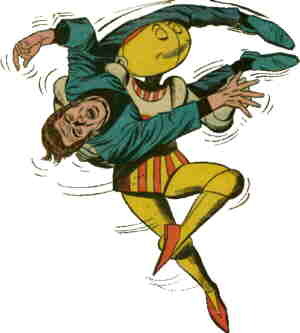 Even Ilda got a happy ending, as she hooked up with Stella's bodyguard, an incredibly ancient robot named Automan — who, incidentally, had been the hero of a vanishingly obscure series that appeared sporadically in DC's Tales of the Unexpected during the mid '60s, set in what was then the present day. The four wound up going into business together, teaching the art of private investigation to robots. Star Hawkins also appeared in a 1990 mini-series, Twilight, alongside other DC heroes set in the future, such as Tommy Tomorrow, Manhunter 2070 and even Space Cabby. But there are internal reasons for many readers to consider this story non-canonical, i.e., not the "real" Star Hawkins. At no time did Star or Ilda ever appear on a comic book cover.